A snowplow machine on interstate 70 Thursday, May 3, 2018. The Colorado Department of Transportation is looking to address a lack of snowplow drivers this season by offering new incentives to potential employees. Lesser-used roadways may take a little longer for the state to plow this winter as the Colorado Department of Transportation scrambles to address a shortage of snowplow drivers. According to CDOT, a national shortage of candidates with commercial driver’s licenses is the main culprit behind the lack of snowplow drivers this season, which has forced CDOT to provide new incentive programs. 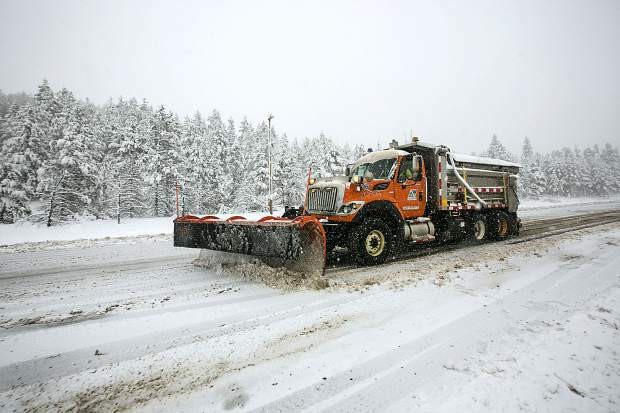 The department typically staffs about 850 plow drivers in any given year, though that number has dropped to about 750 this season, said CDOT’s statewide communications manager Bob Wilson. Wilson also noted that while CDOT typically has a few maintenance positions to be filled, shortages of this size are very rare. According to the Bureau of Labor Statistics, Colorado’s unemployment rate has been dropping steadily since the end of 2010 and is currently sitting at around 3.2 percent, or 13th-lowest in the nation. So while a lack of individuals actively seeking new employment may be playing a role in the shortage, the bigger issue is likely competition. Wilson noted that, despite a relatively stable and adequate maintenance budget, CDOT often can’t compete with other industries offering better pay and more enticing packages to employees. Regardless of shortages, Wilson said that the department isn’t overly concerned about maintaining roadways this winter, though it will likely mean delays in plowing lesser-used roads around the state. He noted that heavily trafficked thoroughfares such as the Interstate 70 corridor remain the top priority for the department. When storms are expected, drivers will be pulled from less busy areas to help maintain roadway conditions. Unfortunately, that also means less attention to more minor roads. With slower responses expected to more lightly trafficked areas, Wilson advised that drivers traveling on those roads be prepared by knowing the conditions, checking weather cameras, looking for CDOT updates and taking appropriate safety measures before venturing out. Given the department’s dedication to roads such as Highway 9, Highway 285 and I-70, those residing on the Western Slope actually may not feel the effects of the shortage or the constant driver shuffling as much as the rest of the state. Also of note is that while areas on the Eastern Slope only go onto “snow shift” when a storm is imminent, crews in mountainous regions along the I-70 corridor are on snow shift around the clock for the entire season. But CDOT is still looking to remedy the issue through any means it can, including offering new incentives to potential drivers and expanding the search area. This season the department is increasing wages for temporary highway maintenance employees from $19 an hour to $22 an hour. Additionally, CDOT is allowing retired maintenance employees to return to work for $25 an hour or their previous hourly wage if it was higher. Wilson said that the department also is giving managers more flexibility to hire full-time temporary employees, on-call temporary employees or permanent workers, depending on their desire. In certain cases, CDOT will also provide housing stipends to entice drivers. Perhaps most notable is the scope of CDOT’s employee search. Typically the department restricts where its employees come from, requiring workers to live within 30 miles of Colorado’s borders. This year the Colorado Department of Personnel and Administration is providing CDOT with a six-month residency waiver, allowing maintenance employees to be hired out of state. In other words, if someone in Kansas or Utah is looking to drive a CDOT snowplow this season, they now have that option.